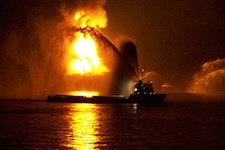 One Year After Deepwater Horizon: What's Changed? One year after the worst oil spill in U.S. history began, key questions about its environmental impact remain unanswered. The 4.9 million barrels of BP oil that spilled into the Gulf of Mexico continue to threaten marine wildlife and other vile surprises have surfaced along the way. Unfortunately, protests from these communities are unheard. Low-income and minority communities are typically targeted for oil production due to inadequate political power, but indigenous women in the United States and Canada are ready to change that. “We are trying to build the capacity of community leaders who are on the frontlines of these issues so that they can address these issues themselves,” Gemmill says. Her organization trains community members who are confronted with massive industrial projects and provides them with legal assistance and political support. Women’s Earth Alliance similarly links indigenous women leaders with legal and policy advocates who can, pro-bono, help them fight extractive industry, waste dumping and fossil-fuel production on sacred sites. Meanwhile, Congress continues to neglect the National Oil Spill Commission’s advice to endorse safety regulations, while demands for domestic offshore drilling become more vocal under presumptions of lower gas prices and increased employment. But are these reasons worth the economic and environmental risks associated with drilling offshore? On Wednesday, the Bureau of Ocean Energy Management, Regulation and Enforcement approved the Cape Wind Project, a plan to build an offshore wind farm five miles off the southern coast of Cape Cod. First proposed 10 years ago, the farm will consist of 130 wind turbines, each 440 feet tall and capable of producing 3.6-megawatts of energy. The controversial project has been opposed by some environmentalists, who expressed fears that the installation of the turbines could have destructive impacts related to aviation traffic, fishing use, migratory birds, and oil within the turbine generators, among other issues. Moral issues are raised too, as local tribes have fought against the Cape Wind project. Earth Island Institute’s Sacred Film Land Project has reported on the Wampanoag Indian tribes’ petitions, which ask for protection of sacred rituals and a tribal burial grounds located directly in Cape Wind’s path of installation. A somewhat worrisome study published Monday by the Yale Project on Climate Change Communication sheds light on Americans’ climate change knowledge. Results show teenagers understand climate change better than adults, regardless of having less education overall, with a larger percentage believing climate change is caused by humans.